Are you struggling to attract visitors to your restaurant website? Have you been frustrated because your views have been slowly declining for months? Website trends can change seemingly overnight. The strategies that worked for you a couple years ago may not be cutting it anymore. Whether you’re building new restaurant websites from scratch or you’re simply tweaking an existing site, the following five components of a website are must-haves for your site. The vast majority of consumers search for restaurant information on both computers and mobile devices. They often weigh multiple restaurants before deciding where to dine. A responsive web design means that the site will work on any device without any issues. Whether a customer is viewing it on a desktop or laptop computer, tablet, or mobile device, he won’t have any problems navigating any of the content or completing any necessary tasks (e.g. making a reservation). Modern websites are clean and streamlined with minimal backgrounds and straightforward navigation. Choose a layout with a white background, and use consistent fonts and colors across the site. Ideally you should be using these fonts and colors for your entire online presence, such as social media accounts. Consider the usability of your navigation. Customers should be able to find what they’re looking for quickly and easily. Your interactive menu must feature high-quality images of menu items as well as key details about the items such as prices, ingredients, nutritional value, spice level, and allergens. Many restaurants now have the capacity for customers to place and pay for orders online. You may also want to think about including social sharing content, such as a hashtag that customers can use when they share their dining experiences on Twitter and Instagram. We live in a visually oriented society where people use photos to make decisions about everything from what to order for lunch to what color scheme to use for decorating the kitchen. High-quality visuals have also become critical with the explosive growth of photo-sharing social networks including Pinterest and Instagram. Make it simple for customers to share your high-quality images of your food as well as the interior and exterior of the restaurant. TripAdvisor is now the world’s largest travel site. Having a presence or page on the site for your restaurant is essential for success. The bottom line is that the more reviews you have on TripAdvisor, the more business your restaurant will receive. Make it super easy for customers to review your restaurant on TripAdvisor by adding the TripAdvisor widget to the site. Keep in mind that you don’t have to overhaul your entire site at once. Focus on areas of need and then build from there. 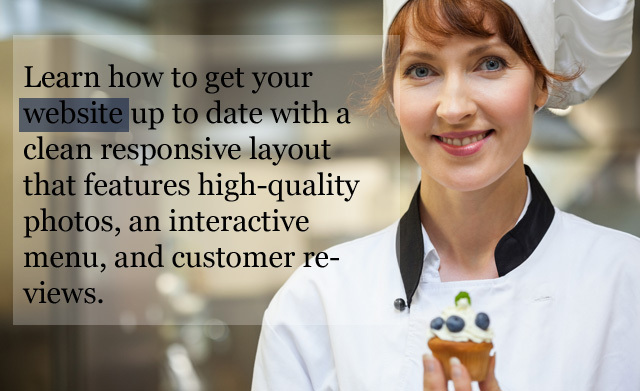 For example, if you haven’t touched your layout in five years, work on implementing a clean responsive design before you worry about creating an interactive menu or hiring a photographer.